Samuel had two sons whose names are Joel and Abijah. Joel and Abijah did not follow the good examples of their father, Samuel because they accept bribes to make unfair decisions. 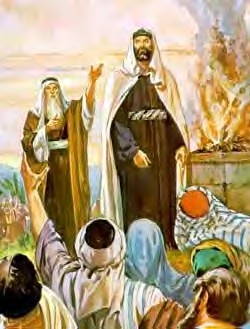 Samuel felt disappointed that the Israelite does not want to listen to God. Samuel said to the people, “If you let a king to rule over the Israelites, this is how it will be. The king will make some of you to join his army; some of you to be in charge of his armies; some of you to work at the king’s farm and reap its harvest; and some of you to make weapons for him. The king will force your daughters to make perfume for him, and cook for him. The king will take away your best fields and olive orchards and give it away to his officials. The king will take a tenth of your crops and give it to his officials. The king will take away your best slaves and donkeys to work for him. The king will take a tenth of your sheep and goats. He will also make you his slave. You will finally cried out in prayers to the Lord and beg Him to save you from the king. Then Samuel sent the Israelites back to their home.